2012 MFD: 22.8 / SD: 5.6 / CV: 24.5 / >30: 9.5 Blanket Weight: 3.25 lbs. 2011 MFD: 20.5 / SD: 5.2 / CV: 25.3 / >30: 5.1 Blanket Weight: 2.12 lbs. Besides Casanova's Futurity Award, he also won the AOBA Color Champion award. His AFD's have been 18.3 (3.5 yrs); 22.7 (5.5 yrs); and 22.8 (9 yrs!!) 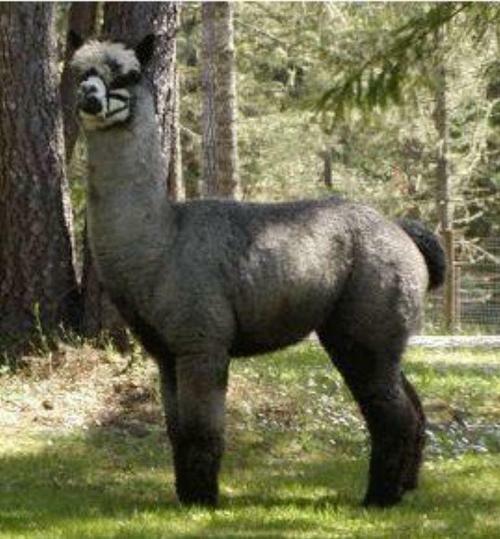 Casanova was also the ONLY grey son of legendary Peruvian Bueno, and 2/3 of his offspring are black, grey or rose grey from dams of all colors. Bueno has been turning out award-winning cria since he was imported from Peru in 1993. His legacy is indisputable. At 18 months old, Rhapsody was an excellent size and weighed over 150 lbs. 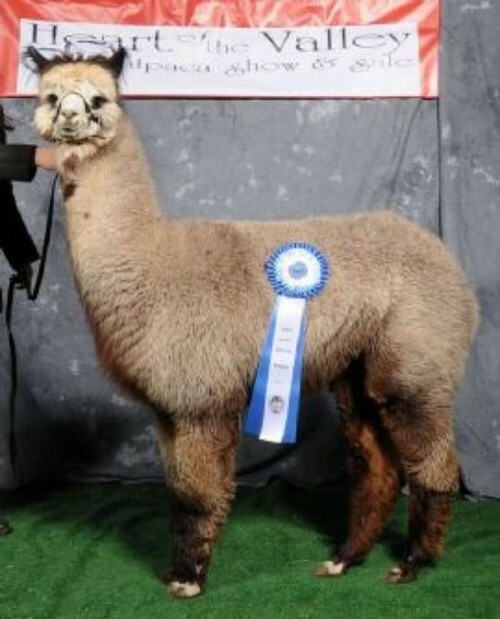 She has won multiple ribbons, and produces excellent crias. Her fleece is crimpy, fine, dense, and has great staple length. Her sire, Aussie Rockford has a regal presence, good bone, strong, handsome head, ideal temperament, excellent conformation and exquisite fleece--very dense, yet fine (even at 10 years old!) and crimpy with a defined lock structure. In 2010, he was appraised by both Jude Anderson and Amanda VandenBosch. They said: "This young male has a good head, a well-balanced frame, and a good bite. 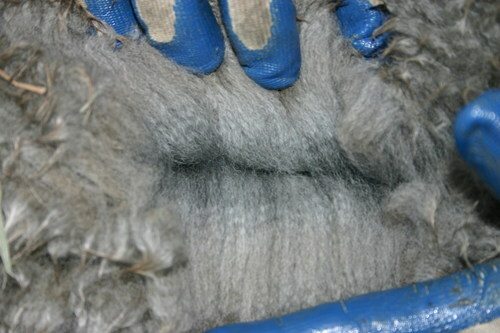 His fleece displays good staple length, has a very nice handle, and an even medium rose grey blanket." 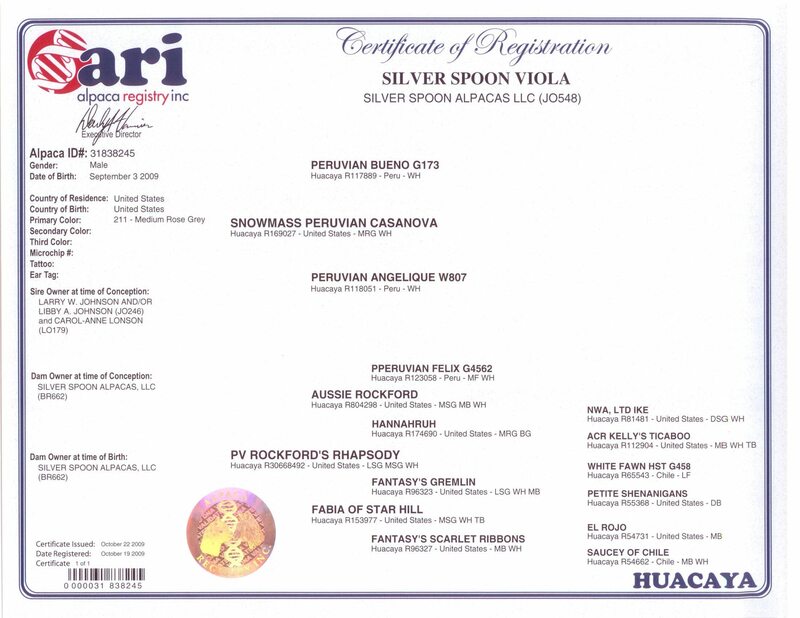 His sire, SNOWMASS PERUVIAN CASANOVA has arguably produced more Champion Offspring than any other Gray Breeding Male in North America! High seller at the 2002 Celebrity Futurity Auction, Casanova was sold for an amazing $147,000! In 2003, Casanova took home the prestigious Futurity Herdsire of the Year honors for his outstanding offspring. In 2005, his son-Snowmass Nova took home the Futurity Dark Herdsire of the Year, and then in early 2006, was sold for a mind-blowing $300,000!!! That was the first time a sire and his progeny have won this prestigious award!! Then, there is Casanova's sire--PERUVIAN BUENO. Bueno's accomplishments and award winning cria are so numerous, it is impossible to list them all. 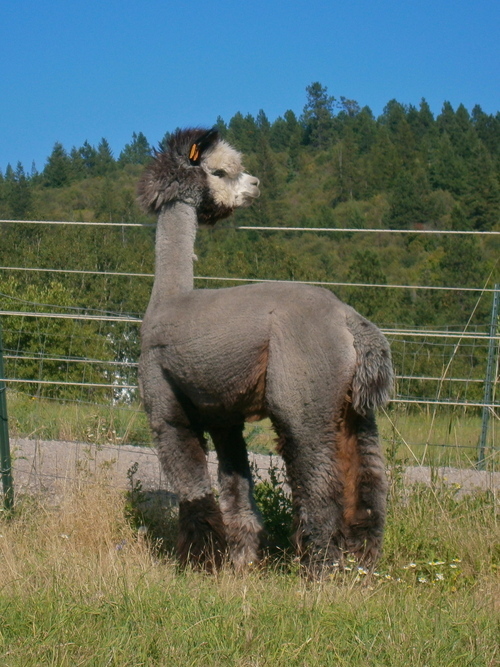 Picked as the #1 choice by three of the country's leading Alpaca breeders, this super Peruvian Macho was the high-selling Alpaca at the 1994 Spring Celebrity Sale. Bueno has also produced more "Get of Sires" than any male in the country - he is simply legendary. On Viola's OTHER side, there is first his dam: PV ROCKFORD'S RHAPSODY, out of AUSSIE ROCKFORD and FABIA OF STAR HILL (out of the top west coast grey herdsire--FANTASY'S GREMLIN & a maroon dam. Her offspring won numerous blue ribbons as well.). In 2008, Rhapsody took a Blue Ribbon in Yearling Grays at the Heart of the Valley in Halter and a 3rd in a competitive class at CABA. Then, there is the famed Silver Gray half-Accoyo AUSSIE ROCKFORD, out of Legendary Accoyo PPERUVIAN FELIX--who was known to throw a wide range of colors and fine fleeces, champions and high selling alpacas--& HANNAHRUH--who's every cria was an award winner or color champion, including the well-known Painted Sky Apres Vous, Aussie Colorado Dillinger, and Aussie Rockford. Aussie Rockford has won ribbons all over the country, in every show he has been in. Of his 186 registered offspring, almost 80% are either black or gray out of dams of varying colors. All of his amazing attributes, he passed onto Viola. As you can see, with this male comes extraordinary potential. What would a Casanova offspring do to enhance your sales list? 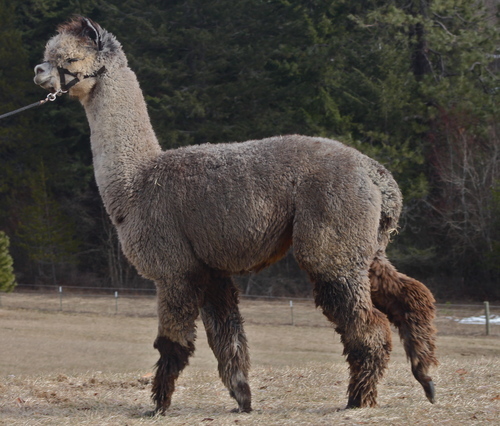 Thank you Mother Earth Alpacas for choosing Viola for breedings!! MRG + StudMaster + Snowmass Casanova! XXGray + Casanova + Aussie Rockford! !